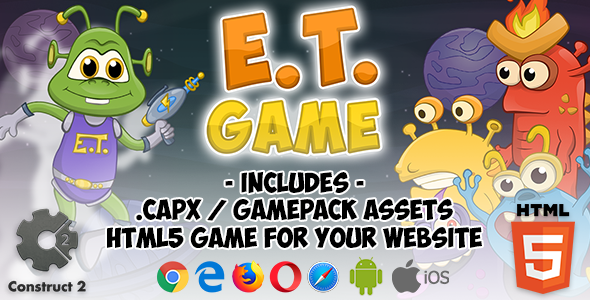 ET Game is a super fun and challenging 2D side-scroller game in the same style as blockbuster games like Super Mario, Donkey Kong and Sonic. The game features 10 levels that will challenge you to beat it. Finish all levels to help the ET find the way to your home! The designs are very colorful and beautiful! Easy to change the images, just replace the image file! NT2: * You must have the paid version of Construct2 to export to Android and IOS. It is not allowed to resell the game as is and also export to android or IOS without changing the graphics. - If you have any question, don’t hesitate in asking me. [email protected] – If You liked the Game, please leave a review!